News about hurricane Sandy came around and certainly changed everyone's routine, even before it arrived. No mind or inspiration to write a post, when one has to face empty shelves and run around in search of water, batteries or propane tanks... So much preparation, so much anticipation! ...At the end, we realized that even doing our best to stay safe, we were at the mercy of nature, and nothing but good luck could help us come out unharmed from the fury of a hurricane. Thankfully, this time we got lucky. 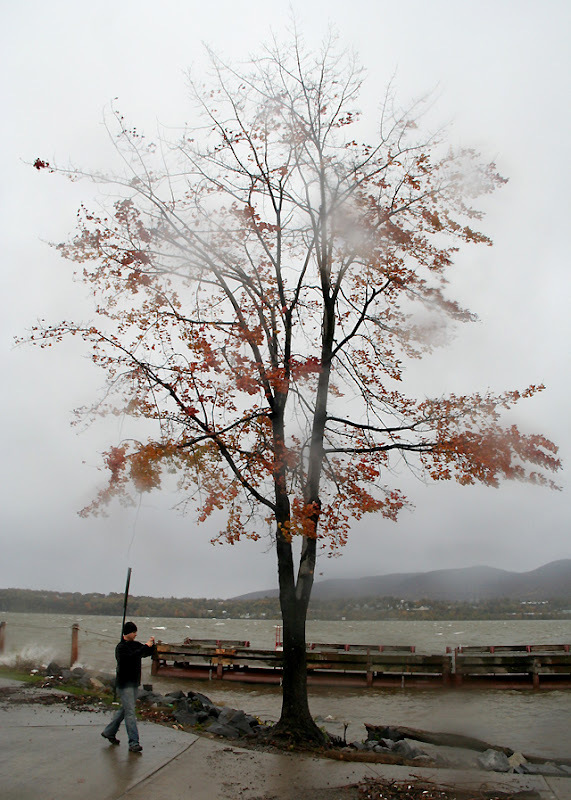 The Hudson Valley, wasn't hit as bad as New York City and the areas closer to the coast did. Today, even though schools remained closed and many are still without power, we haven't seen the level of destruction or floods we had last year, after hurricane Irene. Today, as we try to get back to normal and resume our daily activities, we are also keeping in mind, those who were not so lucky. Our thoughts and support go out to all of our friends and customers who have been affected and are still dealing with Sandy's aftermath. For our readers in other areas of the country or even the world, who wish they could help, know that you can. There are many organizations like the American Red Cross and Americares that are taking donations online and providing relief to the victims of this "superstorm" that badly hit the northeast, last Monday night. Help!! This is a perfect opportunity to accomplish your good action of the day. Information about how to donate to Hurricane Sandy Relief Efforts available here. Fashion meets charity, and it does it in a very beautiful way!! The Pink Shop, a feminine collection of rose toned outfits and costume jewelry, is favorite designer Oscar de la Renta's creation to participate in National Breast Cancer Awareness Month. Until the end of this month, "The Pink Shop" will be tempting us, online and in store, with a stylish gathering of delicate outfits for girls that includes dresses, tunics, leggings, tees, accessories, and extremely gorgeous coats. Just in case you need an excuse to buy more pink for your girl, shopping for a good cause could be a very valid one... Oscar de la Renta will donate 10% of its net proceeds from The Pink Shop to the Society of Memorial Sloan-Kettering Cancer Center. All items in The Pink Shop are available online at Oscar de la Renta's webiste and also at its retail store on Madison Avenue, New York. 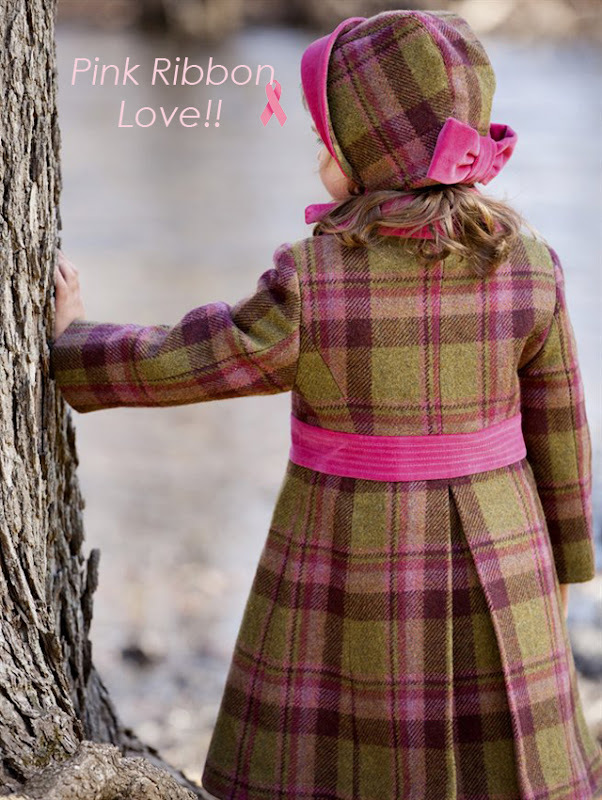 For purchases online, every single item included is conveniently identified with a pink ribbon. So, go ahead, get more pink for your little one, and don't forget to check the pink dresses for moms... They are fabulous!! ...anyway, you are just shopping for a good cause. The Pink Store by Oscar de la Renta is available here. After several years in the business of parenting, you may find yourself running out of ideas for Halloween... Girls have played the roles of every single princess imaginable and boys have portrayed all superheroes the world could ever need... Time to get creative and let your imagination run free? ...Why not?? ... It's Halloween, anyway!! Every year while trick-or-treating with my two girls, I find that the costumes that atract more comments and attention are the ones made at home. Unless you spend a lot of money on something that would be worn for just a couple of hours, most costumes offered at stores are repetitive and cheaply made. A little bit of creativity and time can definitely be the key to an original costume for your little one; ideas as beautiful and unique as the ones shown above, in which not even professional sewing skills are necessary. Feeling tempted already? Get inspired then, gather your supplies and check the links to the tutorials, step-by-step pictures and instructions for projects that are definitely, Halloween contest winners. 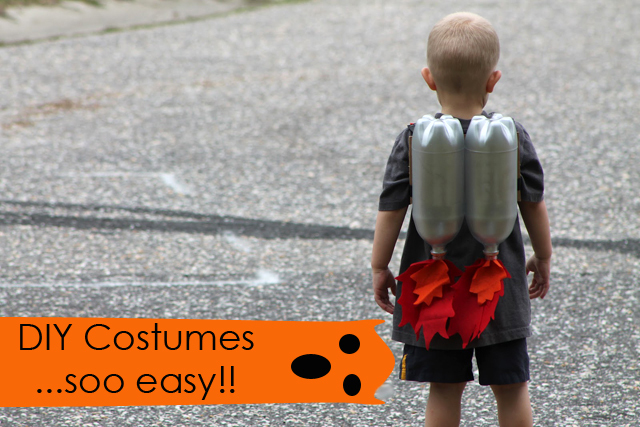 Rocket Power Jet Pack by DoodleCraft available here. Classic Robot Costume by Oh Happy Day available here. 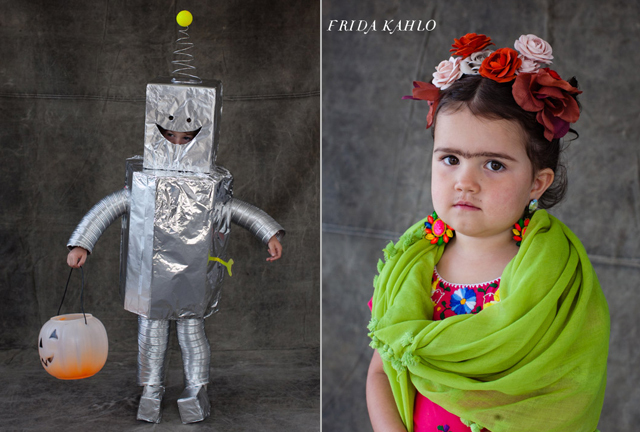 Frida Kahlo also by Oh Happy Day, from the Little Artists post, available here. Andy Warhol by BBmundo, from The Iconics post, available here. 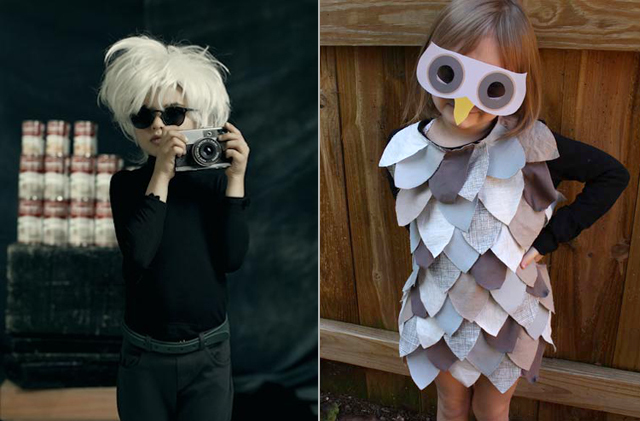 Kids' Owl Costume by Alphamom available here. A time for creativity to pour, the weeks preciding Halloween can also get a little stressful. I always end up with a long list of ideas and pinned projects to decorate the house, make costumes for the girls, bake special treats for school parties... At the end, a few days before Halloween, my good intentions are defeated by reality- time is never enough to do all that, and so I choose a faster option... shopping!! However, I always try to put some time aside to work on a simple craft with my girls, something not complicated that gives us the opportunity to be together, talking, laughing, while our hands do all the work. Trick-or-Treat Candy Buckets with Duct Tape by Mer Mag available here . 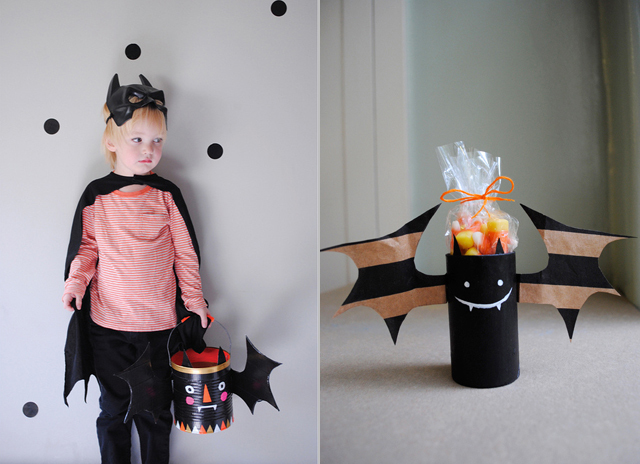 Cardboard Tube Bat Treat Holders by Mer Mag available here. Muslin Mommies by Craftaphile available here. 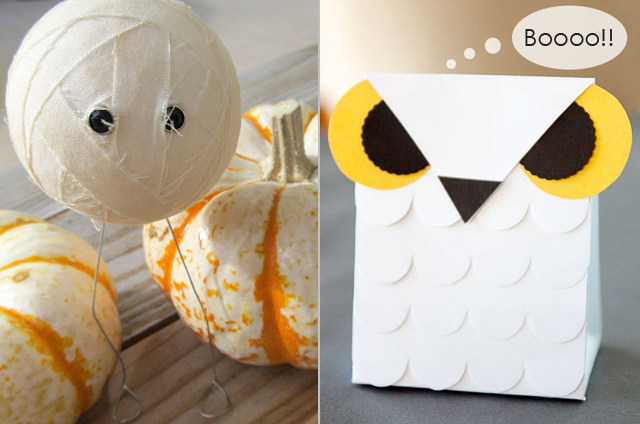 Printable Owl Treat Box by Paper Crave available here. Mummy Votives by Eclectically Vintage available here. 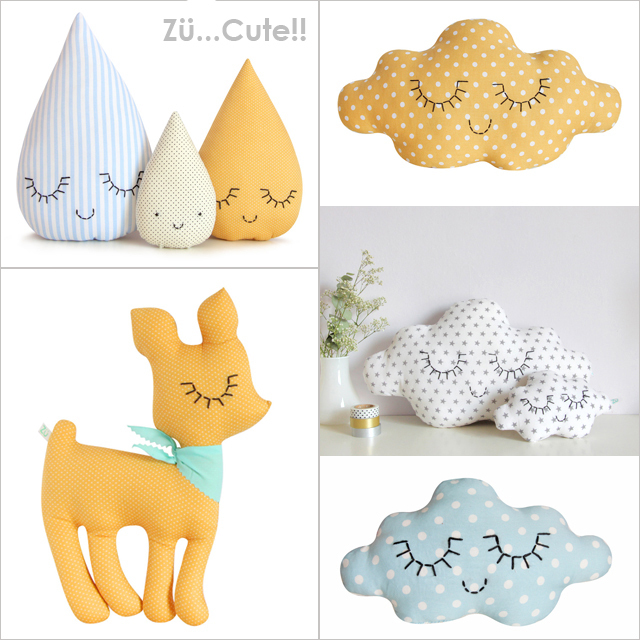 Trendy Nursery: Zu Collection Pillows... Oh, Zu Cute!! How adorable are these pillows? ... and how beautiful would they look decorating a baby's room? Clouds, raindrop families, fawns, and birds, they're all part of Zu Collection, a French brand founded by graphic designer Juliette Collet who also adds illustrations and stationary to her very cute line. All of Collet's designs are handmade in France. Her selection of fabrics is fantastic, delicate prints in pastel tones combined with solid neutral colors, giving her creations a pleasant mix of modern styles with a vintage touch. The added detail of embroidered long eye lashes and sweet smiles, make these pillows just irresistible... Don't you think so?? Zu Collection pillows available here. All pictures courtesy of Zu's website. Spotted via Baby Style Files. A masquerade for Halloween? Ummm!.. why not?? Masks are an ancient tradition turned into art through history. These days, a lot of children find them quite comfortable for "trick-or-treating" and prefer to wear them paired with a regular outfit, rather than walking around with complicated costumes. Animal masks go back to primitive times, when hunting was such an important aspect of life... 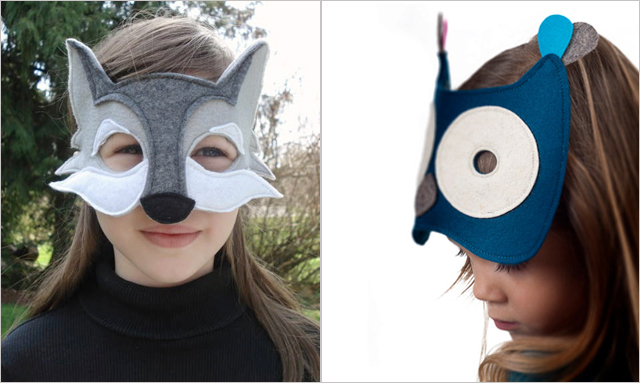 This year I've found a revival of the animal mask with handmade designs in modern styles, representing friendly creatures in trendy colors, made out of ecofriendly materials. Definitely, an option for many kids who refuse to put a costume on. Six masks made it to my list of favorite ones, some are custom made, some are ready to ship, and one of them, even available as a PDF for immediate downloading. One thing I love about masks, is the fact that they may be worn by anyone in the family regardless of size, and they may also be passed along from one year to the next. 1:: Wolf Mask by Mahalo available here. 2:: DIY Printable Peacock Mask by Shades of Every Color available here. 3:: Leather Lion Mask by The Artificer available here. 4:: Wolf Mask by Her Flying Horses available here. 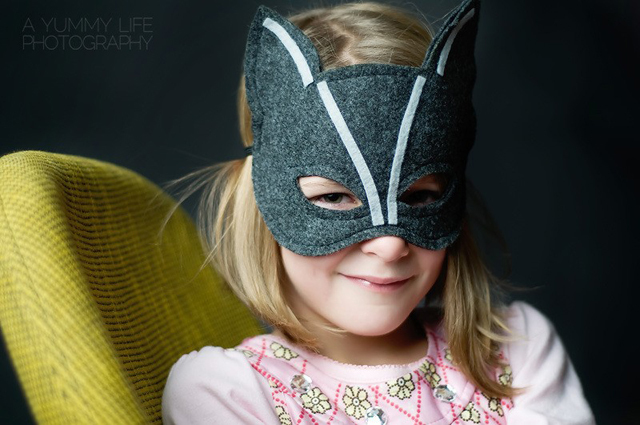 5:: Owl Felt Mask by Frida's Tierchen available here. 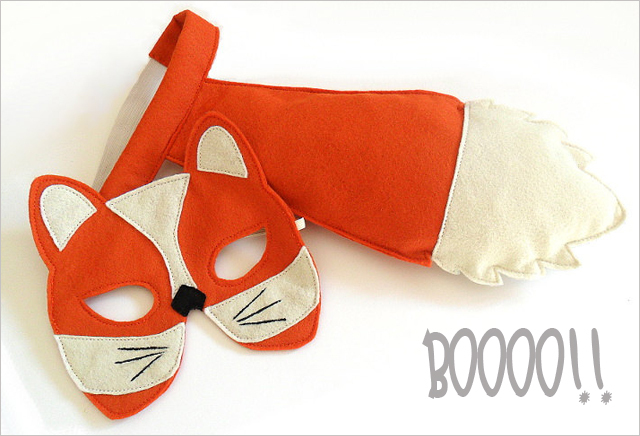 6:: Fox Mask and Tail by BHB Kidstyle available here. I love Saturday mornings when my two girls and hubby leave the house to go to their classes. Coffee, Pinterest and my favorite blogs are the perfect company for the beginning of my weekend. More than anything, I enjoy the peaceful morning and the opportunity to put ideas together for the store and the blog without the usual pressure of time. No posts to write, a comment here and there, and lots of pinning, unless I see something that really, really catches my eye... Then, I can't wait till Monday to talk about it. That's exactly what happened today. I visited Ez Pudewa's gorgeous and inspirational blog Creature Comforts, and got an instant crush on these sweet and delicate animals. They are so cute and well dressed, you won't believe that the fox's clothes are real... yeees real!! How creative is that?? 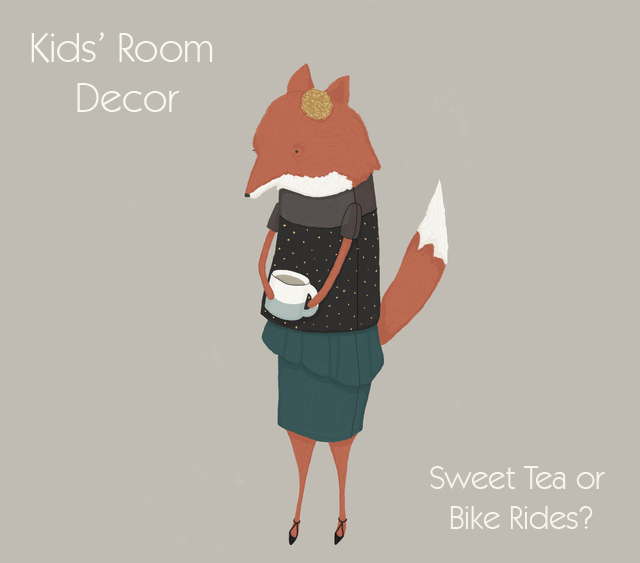 Ez, who often posts about fashionable things that she likes, decided to dress Audrey the Fox with some of her picks. She drew the outfit on Audrey and included the actual links to everything, even the tea mug... I love Audrey's shoes!! 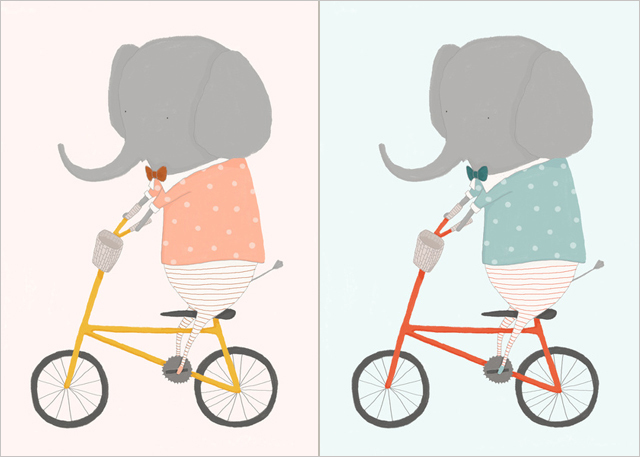 For the elephants, Margaux and William, Ez posted all pictures and graphics of the whole creation process, from the initial sketches to the final printed product... Lovely, too!! Are you ready to shop now? Well, the good news is that all three characters are available as printed wall art at Creature Comforts' store, and during this weekend, orders will be shipped free of charge, worlwide. Creature Comforts print art available here. Halloween is fast approaching and while costumes for the occasion take all of our attention, it frequently happens that we forget what the kiddos will wear for Halloween Day. How about the school party or baby running errands with mom? Many times, we've ended up picking whatever is left at the stores the day before Halloween, but this year we are determined to change that trend. 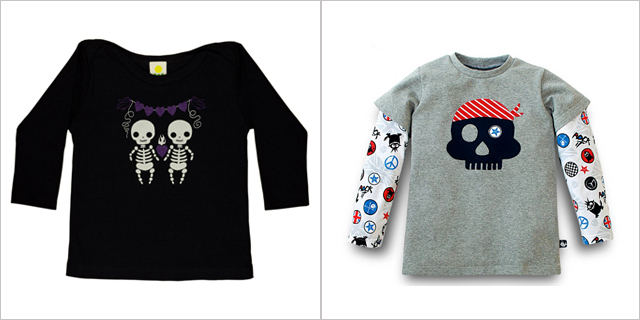 We have already done some virtual shopping and here we are sharing these cute, cool picks that will put your little one on the right path to celebrate Halloween in style. 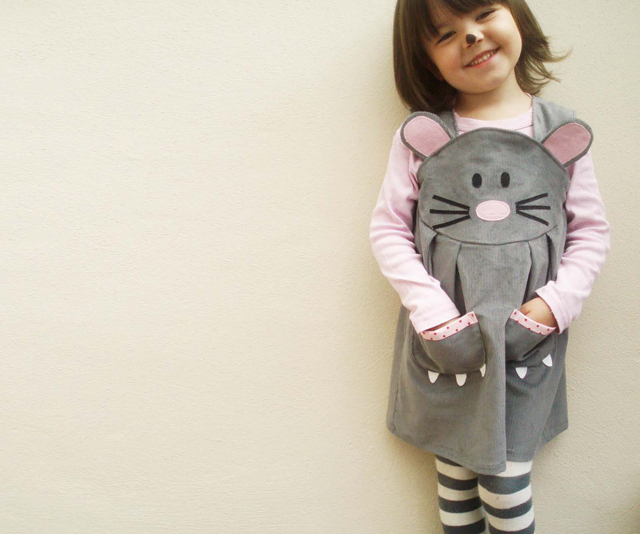 At the top:: Mouse Girl Halloween Dress by Wild Things available here. 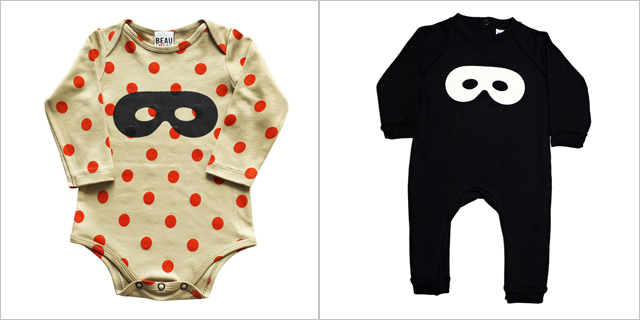 In the middle:: Orange Spotty and Black Superhero Suit by Beau Loves available here. Election Day is Coming Soon: Rock the Vote, Topozoo Style!! Aren't these two hilarious? What would you call this double headed creature? An elephonkey or a donkephant? Is it a Republican or a Democrat? Whether it is an election predictor or a way to show your political preference with fun and civility, this Topozoos collection could also be a nice tool to introduce little ones into the meaning and importance of elections. 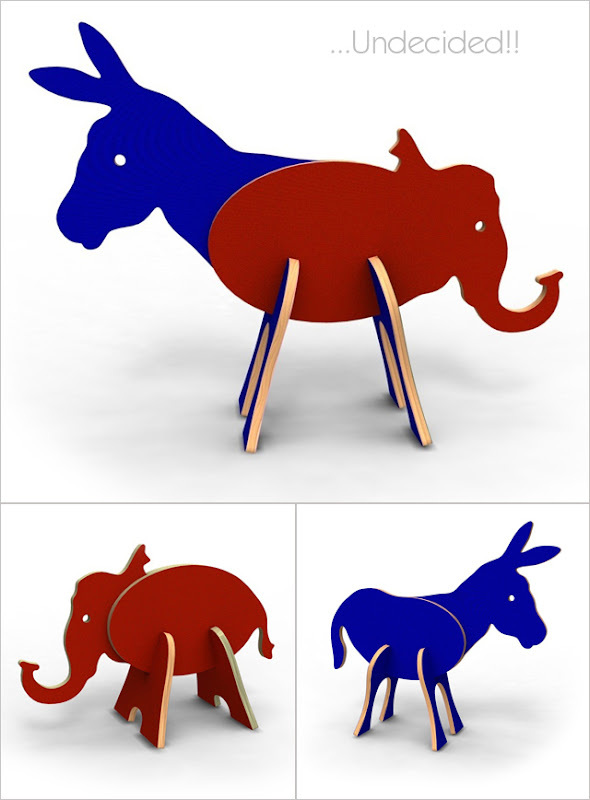 A blue donkey and a red elephant, the "election edition" is part of a much bigger family of Topozoos. Dinosaurs, zoo, mythical and aquatic animals complete the line of ecofriendly wooden puzzles that easily turn into a craft, a room decor or a "mix and match" zoo of hybrid creations. Topozoos' pieces are all made in the USA from formaldehyde-free recycled wood, using child-safe color stains. Each animal or set is packed in a recycled cage box and their pieces can be mixed with all other Topozoo animals. Definitely, a nice gift for children three to eight years old. Patterns, I love patterns, a repetition of color and shapes in a harmonic way can totally take my heart away. But, when it comes to kids' clothing, I prefer to steer away from the typical children themes and arrangements, and many times end up choosing outfits just in solid blocks, to avoid frustration. However, here and there I get surprised with the work of designers who may get inspired by the same well known motifs, boats, trucks, birds and dots... The difference is how they put them together, transforming a simple onesie into a piece of art, something that you could even imagine framed and hung on a wall... that artistic!! Winter Water Factory and its creative prints is one of those names that always pleases my eyes- a combination of modern design with trendy colors and a touch of vintage. 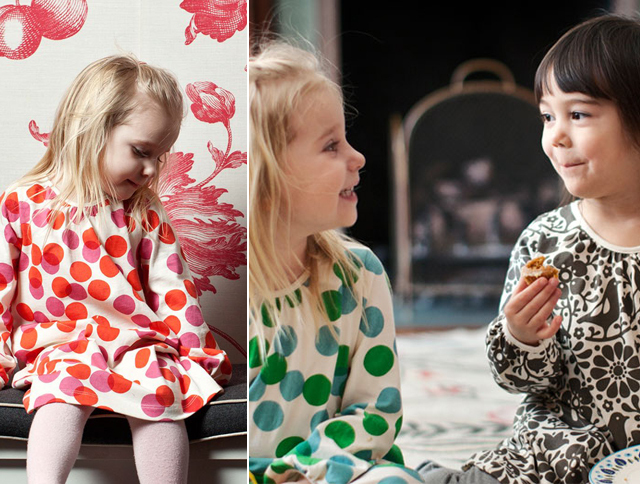 Based in Brooklyn, NY, this design and manufacturing company specializes in screen printed textiles and organic kids' clothes. Every single item is made in the USA, printed on 100% organic cotton and comfortable, basic styles. Winter Water Factory's Fall-Winter collection is out and we are liking everything. The tunic dresses and hoodies for girls are adorable, as well as the long sleeve tees for boys and the rompers for the littlest ones. 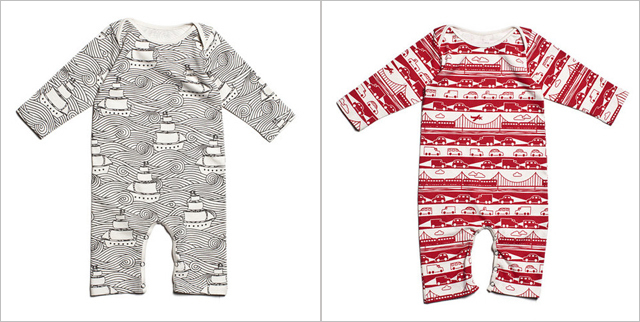 I particularly heart the "High Seas" print in gray and the " Bridge and Tunnel" in red or blue. They remind me of beautiful patterns on vintage wall paper... So unique!! Winter Water Factory available here. All pictures courtesy of Winter Water Factory. Awesome Picks for Kids: A YetiToys Tricycle... What a Ride!! In the world of toys, we may think what else can be new or different to attract kids' attention or develop such a bond that could get them emotionally attached. Well, as we know, creativity is limitless and there will always be an innovation, something with a peculiar twist. YetiToys tricycles have that, a cool, modern looking ride-on with a special feature- they are customizable. Little ones get to enjoy a ride that is also a character, a friend that they can put together, according to their preferences. It's something like selecting the children's pet, but you won't have to train it or look after it when you take it home... nice!! The process starts by choosing a color, the YetiToys tricycles are made of innovative plastic material with a very smooth, velvety surface. Blue, red, green, pink, the possibilities are many. 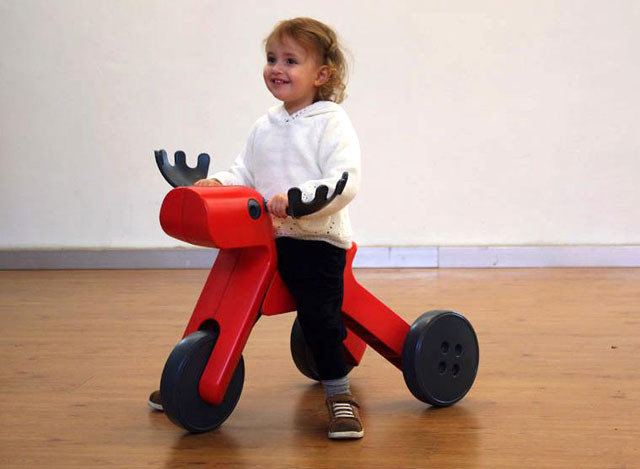 Then, children can decide if they want their ride to be a dog by adding ears, a deer by adding antlers or a horse by adding a saddle. 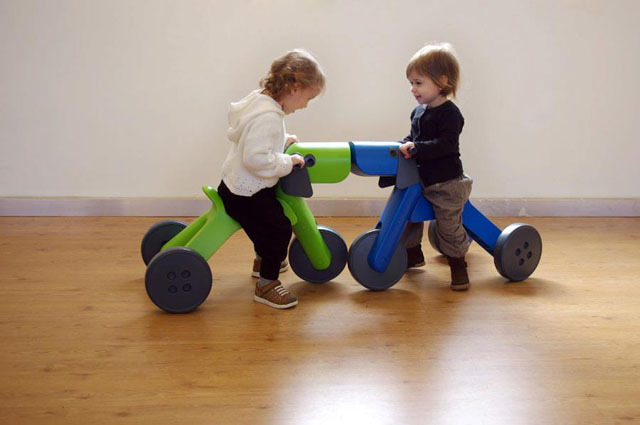 The wheels also provide a choice, they can be made of plastic or rubber, and if kiddo is too young to start pushing a tricycle, it can also turn into a rocking toy. YetiToys are also conceived with safety in mind, a wide body and solid steering handlebar to provide good stability, plus compliance with all safety standards in the USA and Europe. YetiToys tricycles available here. Details also on their Facebook Page.